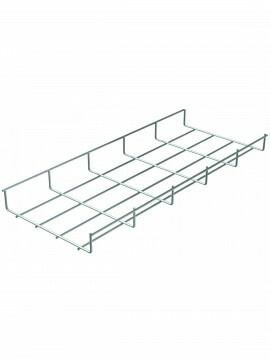 Basket Tray (or Cable Basket) is used extensively for supporting Cables, particularly Data Cables and is an alternative to Cable Tray. Pemsa basket cable tray features a Bycro (bichromed) coating that gives it it distinctive gold coloured appearance and class 4 corrosion resistance compared to pre-galvanised class 2, it's also compliant with current RoHS legislation and RAEE directives. 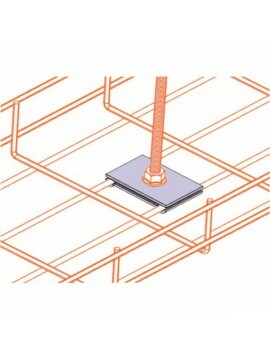 Basket cable tray has a number of advantages over traditional cable tray: It's a lighter in weight, using 30% less material, so is easier for installers to carry and puts less stress on the support points. Bends and risers risers are not needed, simply cut the wire basket with a basket tray cutter and fabricate as required, reducing purchasing costs and time planning. Open design allows maximum ventilation to enable cooler running of cables. Tested and Certificated E90 Fire Resistance. Easier identification of cabling from below.